Down the Freezer Aisle of my grocery store is a little temptation that I confess I have purchased on countless occasions. For those of you who have had them before, I don't need to say anything - you know they're GOOD! 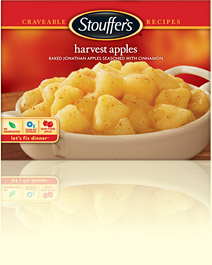 If you haven't tried them, well, let's just say that Stouffer's has managed to make a plain old apple taste like "Coming Home to Fresh Baked Apple Pie Happiness!" Harvest Apples are not intended as a dessert, however, they're more of a special side dish to be served with Country Fried Chicken or a Fish Fry Dinner (at least that's how we like them). I had a few too many apples left over from making the Caramel Apple Cheesecake Dip, and while they looked nice in my wooden bowl, they were going to go to waste if I didn't do something with them. I only have one tool from the Pampered Chef, and this great apple cutter is it. I love it so much that I brought it in my suitcase when we moved to New Zealand and back! I had quite a few apples, so adjust your recipe accordingly for smaller amounts. I ended up using both of my crock pots, so I split the recipe in half for each crock pot. Put the apples in your crock pot, followed by the spices, sugar and then pour the water over top to dissolve the sugar a bit. Cook on Low Heat for about 4 Hours, stirring the apples about once an hour. If you notice the apples getting too mushy, turn the heat off - you want the apples to retain their shape and texture. When they have cooked down, turn off the heat and let them cool. Meantime, using a Siphon or Turkey Baster, remove all of the juice that has settled in the bottom of the crock pot and transfer it into a saucepan. Whisk in the Cornstarch and turn the heat to Med-High. Continue to whisk until the sauce thickens and coats your spoon. Try not to just slurp down the sauce! Add the sauce back into the apples and give a gentle stir. They're ready to serve! After the apples have cooled, you can transfer them into Marked Freezer Bags and reheat them whenever you like! Harvest Apples will stay in the freezer for up to 1 year. You don't have to eat these apples as a side dish only. They could also be used in any recipe that calls for Apple Pie Filling! Enjoy! Great savings and I bet the homemade ones taste better too. I will totally have to try this! They look so yummy. :) Thanks for the recipe! That looks totally delicious! Thanks for the recipe. I wonder if they could be canned instead of frozen? I'm sure this could be canned - but probably using a Pressure Canner since there is low acidity. I'd reference the Bell Book of Canning for times! Just found your blog and I'm in love. :) Thanks so much for providing all these resources! I love these type of "baked" apples. Will definitely give these a try and I love that they freeze well! These look amazing. Can't wait to try them, and with extra to freeze, double bonus. thanks for sharing. that looks soooo good! and the apples remind me of fall ... i'm more than ready for some good fall recipes!! I would love for you come link this up to The CSI Project this week starting wednesday at midnight. It is the slow cooker challenge and this is perfect. Come by all week for great recipes and tutorials. You could win the top prize or our giveaway for the week. It is fabulous! How would you recommend reheating them? On the stove or simply microwave? Microwave for 1-2 minutes, stir, then again for maybe another minute! Cheers!